New concepts in ski design are literally speeding up the learning curve. First, there was the invention of carving skis. This helped skiers to turn more easily on firm snow. Then came the extra wide off-piste skis. Off-piste skis are much wider than the carving skis. This allows for better float in deeper snow, which has again helped to speed-up the learning for wanna-be off-piste skiers. Also more recently, yet another new design concept, the "rocker" shaped skis. This fairly new rocker or reverse camber design, makes learning to ski in deep snow even easier than before. Conventional skis were cambered in their shape. Where as the clever new reverse camber design has lifted the tip and tail of the ski upwards. This new design is dramatically helping two key areas in skiing: balance and turning. How do the rocker designed skis help for balance? The front of the skis are bent upwards towards the skier. This provides for more forward balance support, preventing the tips of the skis from diving deep into the snow. This is revolutionary. In fact, this one design improvement alone is helping many people to master off-piste & deep powder snow skiing. On conventional skis, it would have taken a skier much more balance practicing and forward face planting in the snow to learn the skills required to stop the ski tips from diving deep into the snow. How do the rocker designed skis help for turning? As the front and back of the skis are bent upwards towards the skier, they sit higher up in the snow pack than the middle of the ski. This means there is less snow encasing the front and back of the skis. Less snow equates to less resistance around the front and back of the skis. This reduction of resistance allows easier rotation or pivoting movement of the skis. In simple terms, twisting the skis becomes easier. There is a downside to this speeding up of the learning curve. It is now possible for an intermediate skier to venture off-piste into potentially dangerous terrain and snow conditions without having learned avalanche awareness skills through experience and time. In the past, it would have taken an intermediate level skier years to master the correct off-piste technique, and in doing so, they should have also had the time to develope mountain awareness and avalanche safety skills. With this in mind, it is highly reccommended to learn off-piste skiing with a qualified ski instructor who can also help with the mountain awareness skills needed to ski safely off piste. 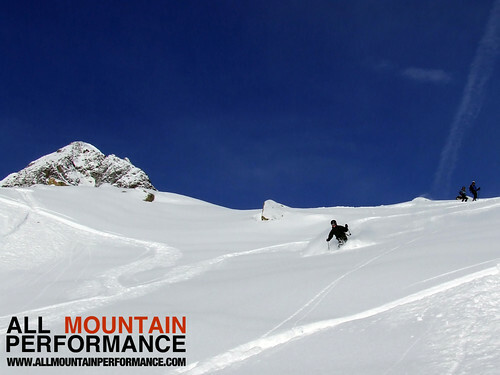 By Mark Gear, head ski instructor at All Mountain Performance Chamonix. Forecasts looking good for the start of the season! It's generally been a wet autumn in the Alps with variable temperatures and some early snow. So far there are a handful of resorts open - mainly the high glacial resorts such as Tignes. There are a few more due to open this weekend December 1st, including Les Deux Alpes and Val d'Isere, and according to the forecasts it looks like there is more snow on the way during the coming week. This time of year can often be a bit nerve-wracking for ski resorts and people who work in them as they scan the skies and the weather reports, but it looks like this week will bring cold temperatures and a good dose of the white stuff to many areas. Chamonix temperatures for example, are set to tumble this week, with precipitation all week and the rain-snow limit falling from above 2000m tomorrow to below 1000m by Thursday ( see the Netweather forecast here !). It's a similar situation in St Anton, Verbier, Zermatt and Val d'Isere. There'll be a few more resorts openingon 8th December, including partial opening of Chamonix's Grand Montets, and the majority of resorts will be opening 15th December. That's now a little over 2 weeks. Bring it on - we can't wait! Presumably if you are reading this article, then the chances are that at some point you have had a ski lesson. Your instructor might have told you to do ‘something’ with your legs and body so that your skis do ‘something’ on the snow? There really are only four ingredients to make a ski work - all four are used in varying degrees in every turn your skis make on snow – You can tilt (edge), twist (rotate) or bend (weight and unweight) and not forgetting to add some velocity (sliding on the snow). Yes, this is all great stuff and all helpful with the basics of skiing. For me there is way more to skiing than just a few mechanical body movements. If this is the sort of lesson you want then let me know and I’ll direct you to one of the zillions of instructors who teach this way. If you want something more keep reading. Unless you’ve lived on another planet this summer then you will know that the Olympics were in London. If you watched any of the games on TV then you will have heard the pundits talking about the difference between the good and the great. They weren’t talking about anything as tangible as physical strength or athletic skill - the hot topic of the 2012 games was the mental state of the competitors – the positive-self-believe and the knowledge that you’re able to-pull-it-out-of-the-bag on the big day. What is it that you need to be more than just good on your skis? To ski perfect powder turns, shred the bumps or land a cliff drop. Well it’s probably something to do with this summers’ hot topic – You need a positive mental state. What is Positive-self-talk? - To have a clearer picture of Positive-self-talk, it might be easier to imagine Negative-self-talk. Imagine this: I want you to fill your mind with every negative thought you have ever had about everything ever and skiing – Now with those thoughts running round your mind I want you stand at the top of a ski slope and produce your best performance! Does that work for you? Or imagine a ski instructor that constantly tells you what you are doing wrong and not what you are doing right. Or they tell you ‘don’t be scared’ and now you can only think about ‘being scared’. In essence Positive-self-talk is the words, both unspoken and spoken, which we use and are directly related to the results we achieve. This may appear simplistic, but the use of positive language is intertwined with our self-believe. Many top athletes use Positive-self-talk and like anything it requires training and practice to to-pull-it-out-of-the-bag whenever you choose. Perhaps now is the time to eliminate any internal-negative-chatter. This may or may not take some work and time, it really depends on you. Start using language linked to the results you want…how about talking about the smooth line through the powder, that pathway appearing through the moguls or a successful cliff drop landing, you will start to see and feel changes in your skiing and maybe your life…. In my next articles for the Chalets Direct blog I’ll be outlining a few more simple mental techniques you can use not only for skiing but in your everyday life. So, stay tuned-in and learn how to twist, bend and shake your mind into shape and give yourself the mental edge on your next trip.